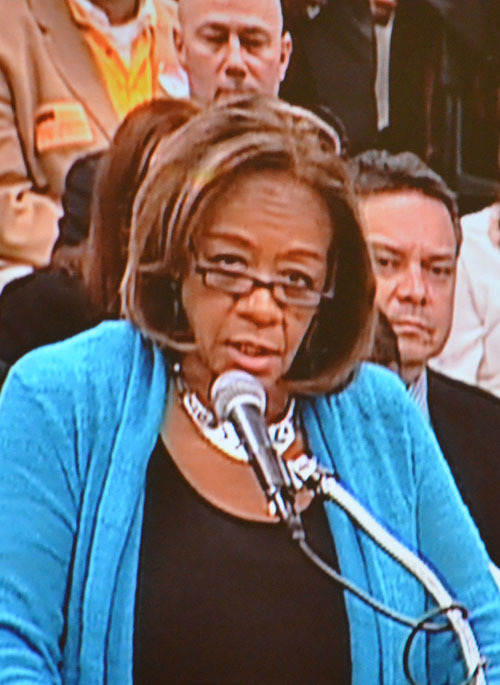 Barbara Byrd Bennett -- the latest quarter million dollar a year "Chief Executive Officer" appointed since Mayor Rahm Emanuel's inauguration less than two years ago -- may be giving speeches about how the proposed closing of 53 Chicago public schools is not "racist", but she hasn't been in Chicago long enough to know the city. She's also been telling the Board and some reporters how she is insulted by the implication that all of her promises are meaningless because she won't be around Chicago in a year (or less). Ohio resident Barbara Byrd Bennett was brought to Chicago one year ago to be "Chief Education Officer" of CPS, but after the collapse of Jean-Claude Brizard's run as "Chief Executive Officer" Byrd Bennett became Mayor Rahm Emanuel's choice for the top job in the nation's third largest school system. At the Board of Education's March 2013 meeting (held on April 3, 2013 because the Board was afraid of the planned protests held on March 27, the day originally scheduled for the meeting), Byrd Bennett took the podium to defend her recommendation that 53 schools be closed (and others put into "co-share" or "turnaround"). Substance photo by Sharon Schmidt.But if her choice of residences and her voter registration are any guide to what she really feels, her heart is still in Ohio, not in Illinois or Chicago. As of April 2013, she is a registered voter in Ohio, where she has an opulent home in suburban Cleveland, the city where her controversial financial practices as school chief were questioned years ago. If Barbara Byrd Bennett were a Chicago teacher today, she would be another exhibit in the annual report of the Inspector General. The IGs energies are largely devoted to persecuting Chicago teachers and other school workers for violations of the CPS residency rule. Chicago teachers must live in Chicago, and investigators from the IG’s office routinely are tracking down miscreants who really live outside the city. Having a sham home in Chicago is not enough if your real home is in, say, Winnetka. But there has been no explanation for her ability to rise above the law, and the Inspector General’s office in not interested in bringing her to justice – in the form of firing her for violating residency. In an ongoing investigation of the illicit activities of the Chicago Board of Education Substance News has definite proof under the standards of the Office of Inspector General to terminate the employment of non-Chicago Residents. Current "Chief Executive Officer" Barbara Byrd-Bennett is not a Chicago resident, which should be in violation of Board Policy 08-0227-PO1, Residency Policy for All Employees of the Board Of Education. In documents obtained by Substance News Chicago Public Schools, CEO Barbara Byrd-Bennett is a current taxpaying resident of Cuyahoga County, Ohio, living in a posh Cleveland suburb. 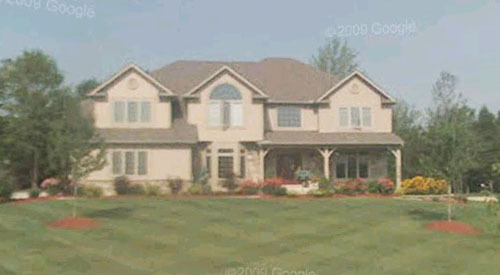 38158 Flanders Drive, Solon Ohio (above) is the permanent home of Barbara Byrd Bennett, according to tax records from Coyahoga County Ohio. Her controversial term as chief of the Cleveland public schools was lucrative, and since then her work through contacts at the Broad Foundation has brought her even greater rewards in Detroit, Chicago, and elsewhere. 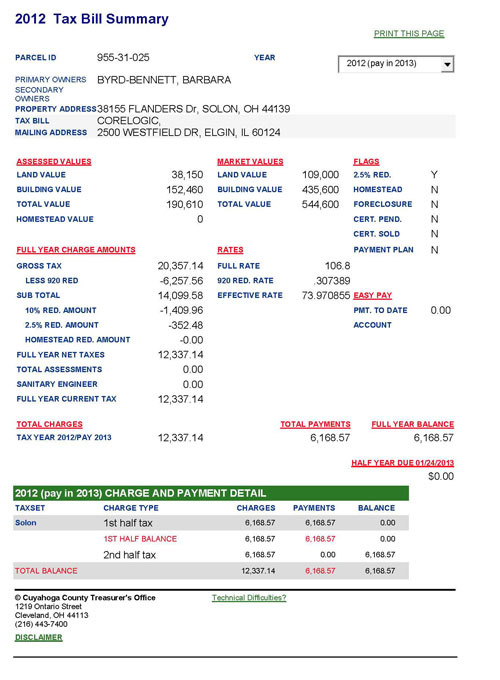 Substance News obtained property tax records for CPS CEO Byrd-Bennett showing that she has paid her taxes this year on the property she owns at 38155 Flanders Dr, Solon, OH 44139, Parcel number 955-31-025. The bill she paid for the property, currently valued at $544,600 was $6,168.57. Tax records go back to 2004 on the same property with the same primary owner listed as Barbara Byrd-Bennett. Not wanting to jump to conclusions, Substance News verified that CPS CEO Byrd-Bennett was in fact a Cleveland resident by further obtaining voter registration records for Byrd-Bennett. As currently as April 3, 2013 Byrd-Bennett is listed as an Ohio registered voter in the 14th US Congressional District, the 24th Ohio Senate District and the 6th Ohio Representative District. The address listed for her voter registration matched the one for her property taxes: 38155 Flanders Dr, Solon, OH 44139. In determining if a CPS employee is in violation of the residency rules, the Office of Inspector General uses property ownership records and voter registration records to establish residence. In the case of CPS CEO Byrd-Bennett all the evidence shows she is in violation of the Board rules to be an employee of the Chicago Public Schools. A source confirmed that CPS is in full knowledge of this residency violation. That the Chicago Board of Education amend its policy regarding residency for all employees of the Board of Education. PURPOSE: The purposes of this Policy are to establish consistent, equitable, and enforceable guidelines concerning the Board’s requirement that all officers and employees of the Board of Education be residents of the City of Chicago that are consistent with state law, 105 ILCS 5/34-83.1, and to establish new provisions to the residency requirement. This Policy is being amended to (1) modify the timeline on which the Board annually designates special needs positions that are eligible for a residency waiver; and (2) modify the duration that special needs waivers are granted from three school years to three calendar years. HISTORY OF BOARD ACTION: On July 9, 1980, the Board adopted a “Resolution to Require Residency Within the City of Chicago of all Personnel Employed by the Board of Education On or after September 1, 1980” (See Resolution #80-149-2.) The Board subsequently adopted Board Report #83-110, which superceded the previous resolution and which provided waivers to its residency policy under certain circumstances. On April 18, 1990, the 1983 resolution was amended to provide waivers for employees in “Special Needs” categories and for exemption of principals from the residency requirement (See Resolution #90-0418-RS1). On November 20, 1996, the Board adopted a residency policy (See Board Report #96-1120-PO1), which exempted employees hired prior to September 1, 1980; allowed any employees hired between September 1, 1980 and August 26, 1996, whose address of record with the Department of Human Resources indicates that he/she resided outside the City of Chicago to continue to live outside the City; and required all new employees to be City residents. On August 27, 1997, the Board amended the residency policy (See Board Report #97-0827-PO4) to allow a six–month grace period for compliance with the policy for newly hired or rehired employees and for those employees formerly in a special needs exemption area. On August 22, 2001, the Board rescinded the residency policy adopted under Board Report #97-0827-PO4, and adopted its current residency policy 01-0822-PO2, which requires all full-time employees hired on or after November 20, 1996 to be actual residents of the City of Chicago, sets forth disciplinary actions for teachers, principals and all other employees and provides for waiver of the policy upon Board action. The Board amended the policy in Board Report #04-0825-PO2 (Adopted October 27, 2004) to (1) identify responsible persons and offices for monitoring compliance with new, non-resident employees’ obligation to establish actual residence within the City of Chicago; (2) identify responsible persons and offices for monitoring compliance with warnings and written reprimands issued to non-compliant employees; (3) establish consistent discipline for non-compliant employees; (4) reduce the compliance period for non-compliant employees from six (6) months to sixty (60) days; (5) clarify the policy and the requirements and procedures for “special needs waivers;” and (6) require employees who must file Statements of Economic Interests under the Ethics Policy to annually certify their compliance with the Residency Policy in the Statement of Economic Interests. The Board amended the current policy in Board Report #06-0726-PO3 to define “material omission of fact” and to make such omissions with respect to an employee’s residency a violation of this policy. I. Introduction. The boundaries of the school district under the charge of the Board of Education of the City of Chicago are coterminous with the boundaries of the City of Chicago. It has been, and continues to be, the belief of the governing board of the district that it is desirable to maintain a policy requiring that its officers and employees maintain their residence within the City of Chicago, and that its educational and governmental purposes are best served by the establishment of the residency policy contained herein. D. economic benefits will accrue to the school system from local expenditure of salaries and the payment of local sales and real estate taxes, and educational benefits will be derived from residency by teachers, administrators and other employees in the City of Chicago. The Chicago Board of Education, therefore, adopts without the necessity of annual readoption the following residency policy. A. “Residency” means an employee’s domicile, the one actual place where an employee lives and has his or her true, permanent home to which, whenever he or she is absent, he or she has an intention of returning. B. “Employees” means all full-time employees as defined by the Rules of the Board of Education of the City of Chicago and officers of the Board. “Employees” does not include the following: day-to-day substitute teachers; part-time employees including part-time Educational Support Personnel employees; full-time provisional substitute teachers; individuals working in the Troops to Teachers program; miscellaneous employees; interns working for the Board on a part-time or temporary basis; or those individuals participating in professional training programs designed to prepare participants for fulltime employment as CPS educators. C. “Continuously employed” means employment that has not been interrupted by a break in service. D. “Break in Service” means a loss of employment as a result of dismissal, separation, and resignation not followed by rehire within one year. “Reassigned teachers” who are appointed to full-time teaching positions within two years following honorable termination shall not have had a break in service for purposes of this Policy. E. “Academic year” means the regular school year commencing in August or September and ending in June. F. “Material omission of fact” means the employee’s intentional failure to disclose his/her actual residence for purposes of concealing from the Board his/her non-compliance with the actual residence requirements of this Policy. III. Current Employees Hired On or After November 20, 1996. All employees hired on or after November 20, 1996 will be required to be actual residents of the City of Chicago within six months from the day their employment begins, except where the employee has been granted a waiver in accordance with the provisions of this Policy. This residency requirement includes principals. A Sworn Residency statement must be completed by each prospective employee by the time his or her employment with the Board begins. (6) months of hire. Principals, area instruction officers and department heads shall commence appropriate disciplinary proceedings for those employees who are not in compliance with this Policy. A principal’s, area instruction officer’s or department head’s failure to monitor compliance with the Policy shall not relieve employees of their obligation to comply with the Policy. November 20, 1996 - the date when the Board originally adopted a residency policy requiring employees hired on or after November 20, 1996 to reside in Chicago - who have remained continuously employed by the Board shall not be required to live within the Chicago city limits regardless of whether such employees have moved into the city since November 20, 1996. Any employee hired prior to November 20, 1996 who has had a break in service after November 20, 1996 will be regarded as a new employee and will be required to reside in Chicago within six months after returning to full-time employment with the Board unless the employee obtains a waiver in accordance with Section VIII. of this Policy. One of the major methods the Chicago Public Schools Inspector General uses to determine whether a teacher is in violation of the CPS residency rules is by examining property tax and voting records. Both for Barbara Byrd Bennett are in Cuyahoga County, Ohio.V. Notification of Change of Address. All employees must notify the Board of a change in their address within fourteen (14) calendar days of their change of address. Notification to the Board of a change of residency shall be in writing or, if permitted by the Department of Human Resources, electronically, and filed with the Department of Human Resources using the procedures, forms and documentation established and provided by the Department of Human Resources. An employee who represents to the Board that he/she resides in the City of Chicago at the time of his/her hire or at any time thereafter and 1) who subsequently moves his/her actual residence from the City of Chicago, and 2) fails to notify the Board of his/her change of address required by this Section shall be deemed to have made a material omission of fact for the purpose of concealing his/her actual residence. VI. Proof of Residency. For the purposes of this Policy, the question of an employee's residence is principally one of where an employee intends to live and have his or her one true, permanent home or domicile to which an employee intends to return following an absence. The presumption in this Policy is that the address an employee gives on a completed Residency Form is that employee's correct address. In disputed cases, the burden of proof rests with the employee to show that his or her claimed residence is the one where the employee intends to live and have as his or her one true permanent home or domicile. Because intent may be manifested in innumerable ways, any residency inquiry must consider all the pertinent factors on a case-bycase basis. Such an inquiry shall consider, but not be limited to, the following factors: voter registration, place of filing tax returns, property ownership, driver's license and car registration. VII. Penalties for Violation of the Residency Policy. A. Principals and Tenured Teachers. According to the Illinois School Code, tenured teachers and principals only may be dismissed for conduct deemed "irremediable," or for "remediable" conduct which employees have been specifically warned may lead to their dismissal if repeated. The School Code defines "irremediable" conduct as conduct which is cruel, immoral, negligent, or criminal or which in any way causes psychological harm or injury to a student. 105 ILCS 5/34-85. The Board shall consider any tenured teacher or principal to have engaged in irremediable conduct and subject to dismissal without prior warning if he/she has intentionally misrepresented his/her actual residence, whether such misrepresentation is made by active representations or by material omissions of facts, with the intent to avoid the residency requirements set forth in this Policy. Other initial violations of this Policy that do not involve such misrepresentations shall not be treated as "irremediable" offenses. Accordingly, in those cases where no misrepresentation occurs, a principal or tenured teacher who is subject to this Policy may be dismissed for failure to comply with the residency requirement if, after receiving a Warning Resolution from the Board, the employee fails to comply with the warning and establish his or her residency in Chicago. All Warning Resolutions issued under this section shall direct the teacher or principal to establish actual residency in the City of Chicago within sixty (60) calendar days of the service of the Warning Resolution. All Warning Resolutions issued to employees under this section shall direct the teacher or principal to submit evidence of compliance with the terms of the Warning Resolution by a date certain, not to exceed fourteen (14) calendar days after the designated period for compliance, to the Office of Labor and Employee Relations. Teachers and principals who fail to comply with the Warning Resolution shall be dismissed. B. Other Employees Subject to the Board's Residency Requirement. All Board employees other than tenured teachers and principals who are subject to the Board's residency requirement and fail to comply may be dismissed. An employee in violation of this Policy shall receive a written warning signed by the Chief Executive Officer or designee indicating that the employee may be subject to dismissal if he or she fails to establish residence in Chicago within sixty (60) calendar days of the service of the written warning. All written warnings issued to employees under this section shall direct the employee to submit evidence of compliance with the terms of the written warning by a date certain, not to exceed fourteen (14) calendar days after the designated period for compliance, to the Office of Labor and Employee Relations. Employees who fail to comply with the written warning shall be dismissed. Any employee, including a newly hired individual, who has intentionally misrepresented his/her actual residence, whether such misrepresentation is made by active representations or by material omission of facts, with the intent to avoid the residency requirements set forth in this Policy shall be subject to immediate dismissal in accordance with the Board’s Employee Discipline and Due Process Policy. VIII. Waiver of Residency Requirement for Designated Special Needs Positions. The Board may grant special needs waivers (“special needs waivers”) of the residency requirement for new employees hired to positions designated by the Board as special needs positions. Special needs waivers provided for under this section may only be granted at the time of the employee’s hire and shall not be granted to existing employees except where the existing employee has been previously and continuously eligible for a waiver since the Board adopted the waiver policy on August 22, 2001; provided however, that nothing in this Policy shall be interpreted to permit an employee who was a City resident at the time of hire to be eligible to apply for a waiver for the purpose of changing his or her residency. Special needs waivers shall be valid for three (3) calendar years after the employee’s date of hire and may be renewed for subsequent three (3) year periods provided that the employee continues to be employed in a special needs position. Special needs waivers granted under this section shall expire on a date certain. In January or February of each year, upon recommendation of the Department of Human Resources, the Board shall designate special needs positions to which special needs waivers shall apply. The Human Resources Department may grant waivers consistent with the Board’s designation of special needs positions immediately after the Board designates the special needs positions. New employees must apply for a special needs waiver at the time of hire in accordance with procedures established by the Department of Human Resources. Current employees who are eligible for special needs waivers under this section must reapply for the special needs waiver before the expiration of an existing waiver in accordance with procedures established by the Department of Human Resources. The Department of Human Resources shall grant such applications for a special needs waiver or to renew a special needs waiver without further Board action provided that the employee will be working in a designated special needs position. IX. Annual Certification of Residency on Statement of Economic Interest. Employees who are required under the Board’s Code of Ethics to file a Statement of Economic Interest shall also certify their compliance with this residency policy in their annual Statement of Economic Interest. The employee’s certification shall include an oath or affirmation that the employee is not required to be an actual resident because his/her date of hire is prior to November 20, 1996 or that the employee has a valid, current Board waiver of the policy issued in accordance with this Policy or that the employee is an actual resident of the City of Chicago.